For Easter, it seemed like a good idea to make hot cross buns using my 100% hydration white starter instead of yeast. 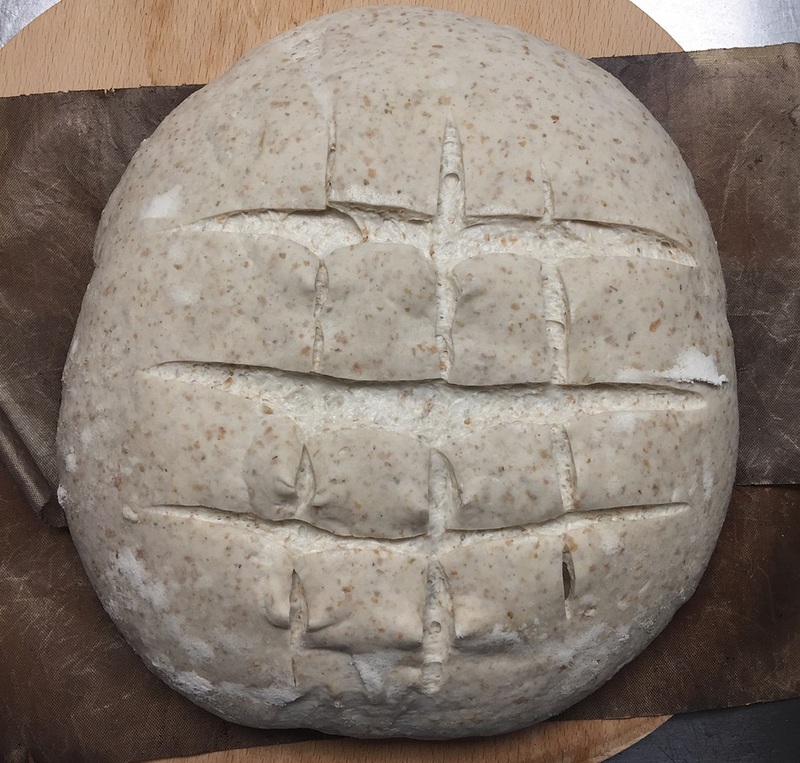 My starting point was Elizabeth David’s version in English Bread and Yeast Cookery, because it is straightforward without too many additional ingredients. The recipe calls for 500g of strong white flour raised by 30g of fresh yeast and incorporating 280g of milk. 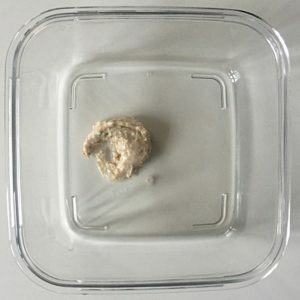 I decided to make 200g of 100% hydration leaven, which I built in two stages using water, not milk, because I have never tried feeding my starter with milk. So my final buns are probably not as soft as they would have been following the recipe “properly”. I also had to substitute raisins for currents. Warm the butter in a little (25g) of the milk. Scrape the leaven into a larger bowl and add the milk. Break up the leaven somewhat and mix in the sugar, salt and spices. Stir up the butter in the warm milk and add that and the eggs, one at a time. Add the flour and stir until all the ingredients are mixed. Finally, add the raisins (or currants if you have them) and stir again to mix everything together. The dough will be soft and golden yellow, speckled with bits of spice. Cover with a damp tea towel and set aside somewhere warm to do it’s thing. After about four hours, my dough had puffed up a bit, but not quite enough. I transferred it to the oven with the electric light on and left it there for another four hours. By that time, it had more than doubled in volume. I can’t be precise about how long the bulk ferment ought to take; as ever, watch the dough, not the clock. To prepare for making the buns, I did a very quick set of stretch and folds in the bowl then tipped the dough onto the counter. 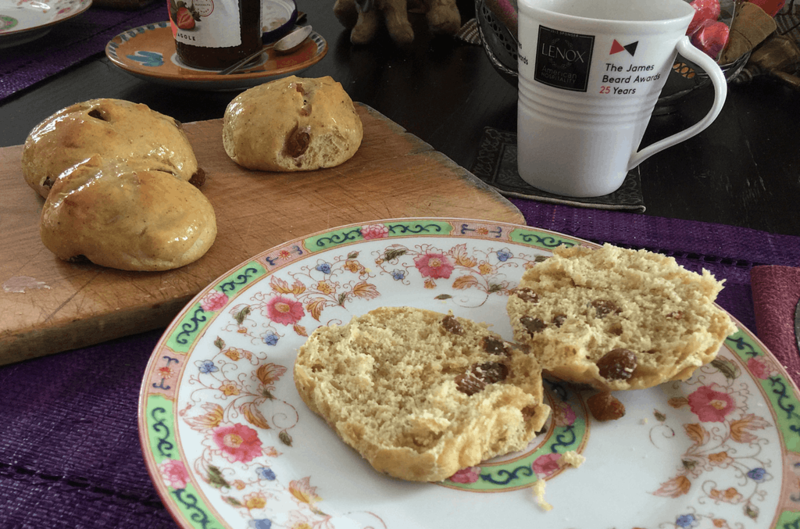 I scaled each bun at 65–70g; some recipes advise larger, about 90g. Shaping is a bit tricky. You just want to try and form them into a little ball by tucking under, like a miniature bread boule. Doing it on a floured surface and then pinching the bottom to seal worked for me. 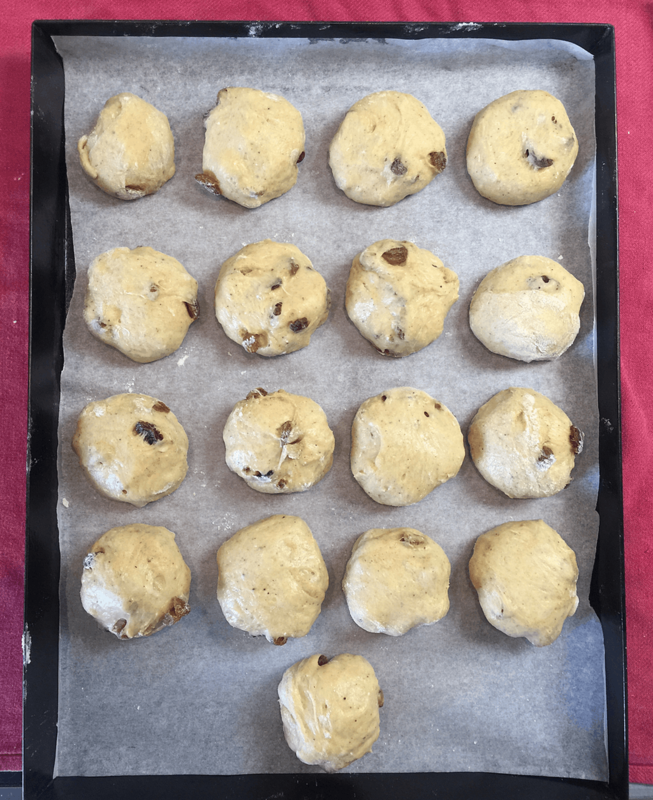 Place the shaped buns fairly close together on a lined baking sheet and cover again with a damp tea towel to prove until noticeably puffed up. I returned mine to the oven with the electric light on for about an hour. Preheat the oven to about 200°C (removing the buns first, if that’s where you put them to prove). At this point you could pipe a cross on top of the buns, but you’ll have to search for another recipe to do that. I just cut a cross in each bun, which wasn’t a huge success but was at least a gesture. Bake in the centre of the oven for about 20 minutes. Provided that the dough was well matured and baked at the right moment, the crusts will be fine and soft and the glaze will not turn tacky or sticky but will form a fine shining mirror-like finish to the buns. Opened and ready to eat; good just as they are. Well, shiny they certainly were, but also tacky and sticky. I’m prepared to concede that perhaps the dough was imperfectly matured and baked at not quite the right moment. But they were absolutely delicious. 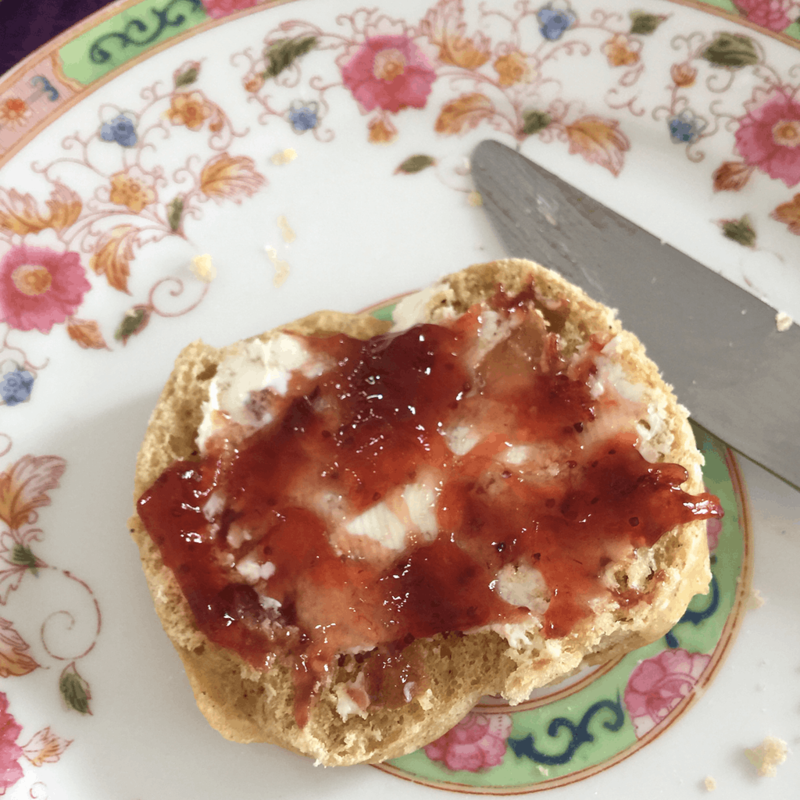 Gilding the lily with butter and plum jam, homemade in someone else’s home. I was a bit worried that it might not work out, because the dough is pretty rich and might have been too much for the microbes. 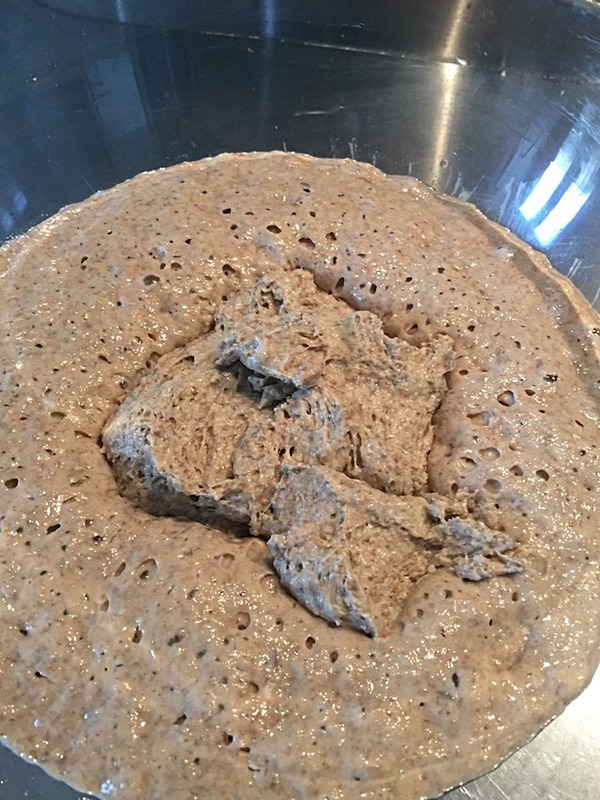 Given more time, I might have built the leaven with a slightly richer mix, maybe including some milk and even sugar in the feed, but as it was I needn’t have worried. As @litchfieldkitchen advised on Instagram, “have faith”. Which seems appropriate, even if I don’t have that sort of faith. The problem was of my own making. A bit of bad planning meant both that we were due to run out of bread on Saturday and that my schedule for Saturday was very full. Certainly no time for any of my normal loaves. 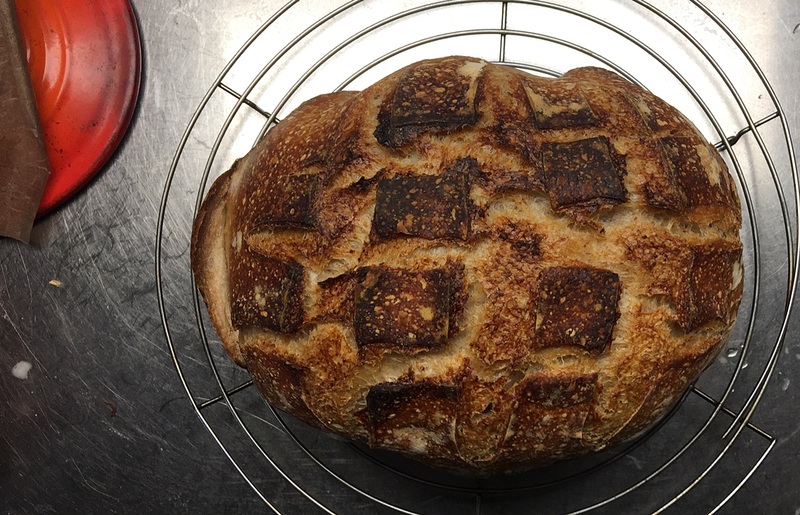 But a somewhat new approach saved the day with a stunningly good loaf on Sunday morning which, I swear, took me no more than 5 minutes in total on Saturday, and it was all totally serendipitous. In one sense, my saviour was Jeremy Shapiro. 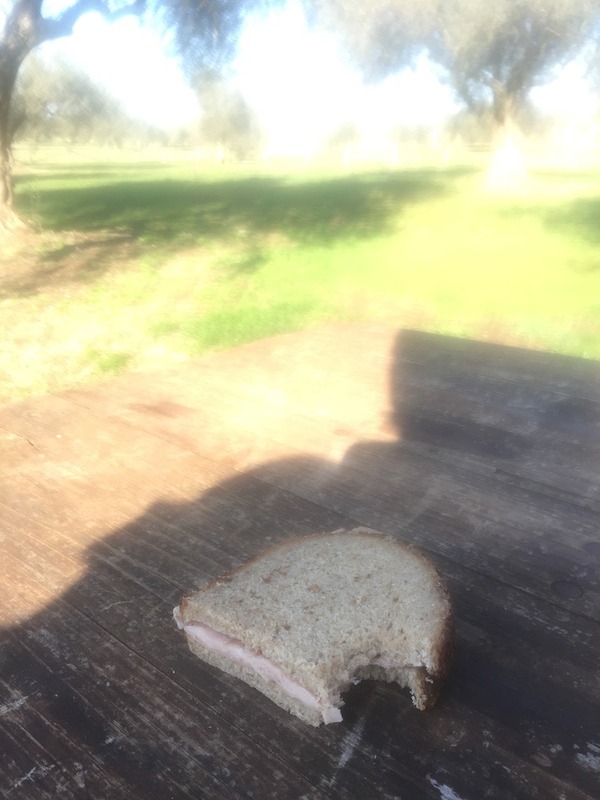 On Friday, he wrote about Do-Nothing Bread, which I read because I read everything he posts. That was about an approach detailed in a book called Respectus Panis, written by a group of bakers called Les Ambassadeurs du Pain (in French, obvs., with the most intensely annoying automated music to boot, which is why I immediately went in search of details elsewhere). I failed to run down anything very detailed, but that didn’t bother me as the whole thing looked to be pretty simple. Tiny quantities of inoculant, minimal amounts of salt and lots of time. In other words, not unlike Lahey’s no-knead formula. Just the thing, possibly, for a busy-day bread. Disperse the starter (you could use just a smidgen of yeast instead) in the water, add the salt and the flours and stir enough to mix all reasonably well. Cover loosely and go out for the day. Come back and give it a set of stretch and folds in the bowl. Worry that nothing is happening. Go out to the movies, giving another set of stretch and folds in the bowl before you leave. Continue to worry. Come home, prepare a banneton, give the dough a final set of stretch of folds and then a coil fold directly into the banneton. Try to persuade yourself that there does seem to be a bit of activity. Cover loosely and go to bed. Wake up, remove loose cover and marvel at the rise. Pretend you never had any doubts. Preheat the oven and a casserole to max (about 220°C). Gently tip the dough onto baking parchment, slash quickly, worry that it is spreading too fast and get it into the casserole, pronto. After 27 minutes, remove the casserole lid and marvel all over again. Bake for a further 27 minutes. Remove and allow to cool before digging in for lunchtime. Give thanks to fellow bloggers and bakers. 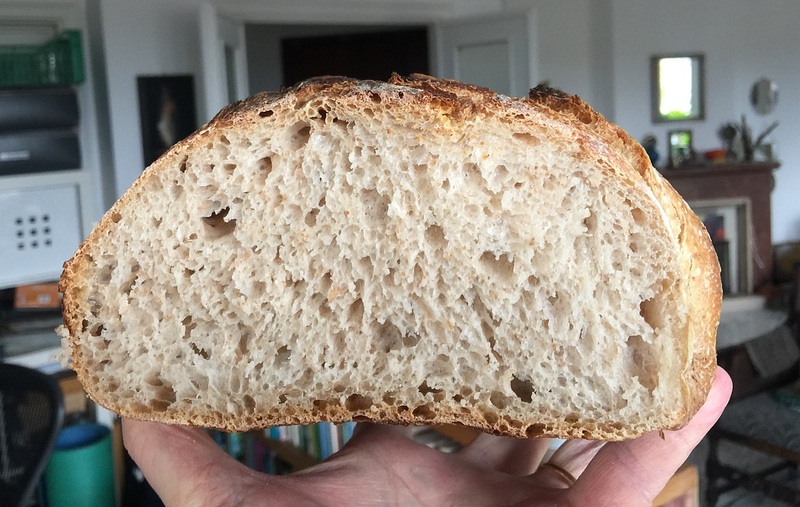 And, of course, yesterday’s issue of the Bread magazine newsletter had a little story linking to Jeremy’s original post and some detailed versions of recipes. Mine was not exactly like any of those, but it was very fine. Do I now need to wait for another super-busy day to repeat? Probably not. Lately I’ve started baking in greater bulk to satisfy my slowly growing list of people who pay me the ultimate compliment of paying for my bread. That could make sharing recipes here a little bit tricky, because not everyone wants to handle four loaves worth of dough at a time.1 Anyway, thanks to the miracle of baker’s math, I can give the quantities for a single loaf just as easily, so here goes. I use my 100% hydrated leaven to start the pre-ferment, and as I store it in the fridge between bakes, that requires two builds to get it good and active, starting the morning before I want to start baking. To about 10g of starter I add 25g of flour and 25g of water, leaving that for about 12 hours to double. I then feed again with 25 g of flour and 25g of water, leaving it overnight. Next morning, I take 10 gm into a clean container and feed again with 25g flour and 25g water. This stays out on the counter for about 6 hours then goes into the fridge for storage. The active starter goes into the pre-ferment. First mix the water and the starter to break up the starter a bit, then add the flour and salt and stir well to incorporate everything into a rough dough. Put that aside to ripen. My kitchen is still pretty cold, so after a day the pre-ferment had barely moved and I had to put it into the fridge overnight. Next morning it had almost exploded out of its box. In warmer conditions, the pre-ferment will double in about 8-12 hours, but it really doesn’t matter much if you refrigerate to suit your schedule. The einkorn was my idea. If you don’t have any, add 50g of some other flour or just use 400g of strong white flour, rather than 350g. The yeast is completely optional, useful if you are in a hurry (or your kitchen is cold). Mix the flours, salt and water and yeast if you’re using it. Knead the dough so that it has started to come together and then add a chunk of pre-ferment at a time, kneading between each chunk to start incorporating it into the dough. I guess about 4 or 5 chunks is right. It takes a bit of kneading to get everything properly mixed in but recently I have found this easier than mixing the pre-ferment with the water first. When the dough is uniform throughout, return it to the bowl, cover with a cloth and leave to bulk ferment. After one hour, do one set of stretch and folds right there in the bowl. 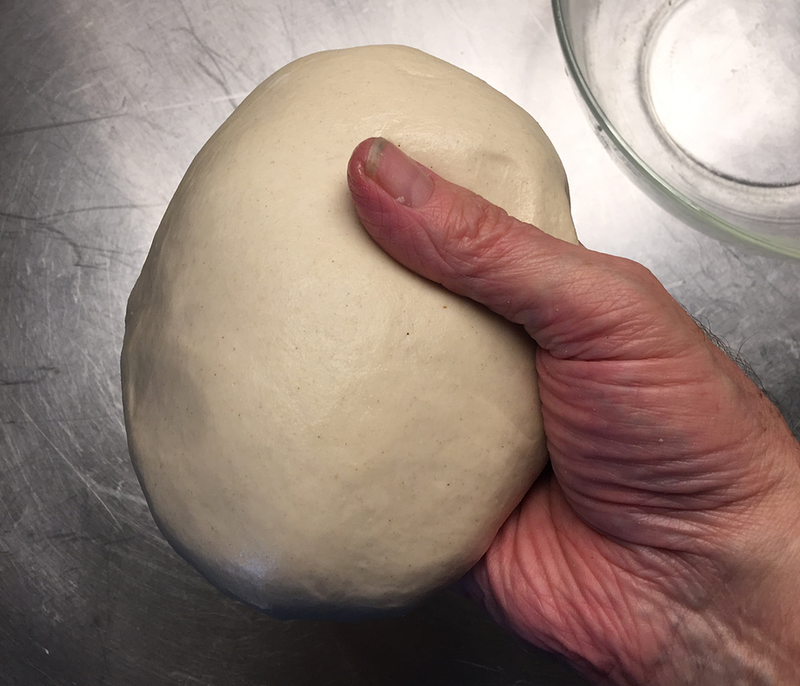 Wet your hand first and slip it gently under the dough, grab and pull up slowly, you don’t want to tear the dough, then fold it back onto the top of the dough and work your way around the ball of dough. One (moving) picture being worth a thousand words, here’s my video. Leave to bulk ferment for another hour, then do a second set of stretch and folds. 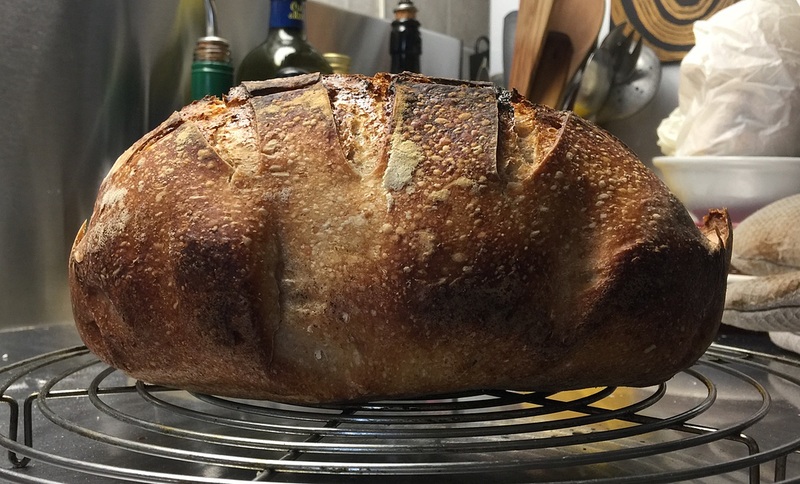 After a final hour of bulk fermentation, gently move the dough out onto the counter, shape, and prove for about 90 minutes before baking in a hot oven for about 50 minutes, with steam for the first half of the bake. It’s a long story, one that I hope will appear on the podcast in the fullness of time, but suddenly we have a supply of superb hummus and other like-minded goodies here in Rome. 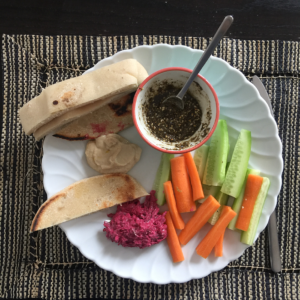 Not so the pita. I mean, it’s OK, as a shovel or wrapping, but not for its own sake. Nothing for it, I thought, I’ll just have to bake my own. In this I was encouraged by friends who seem to do it all the time, posting photos of the exquisite results. Off, then, to Claudia Roden’s A New Book of Middle Eastern Food and her recipe for Khubz (Eish Shami), which, she delightfully tells me, “is more commonly known in the West as Pitta bread”. I hope she won’t mind me sharing my interpretation here. The joy, if you’ve been messing around with highly-hydrated doughs, is in the 15 minutes of kneading. 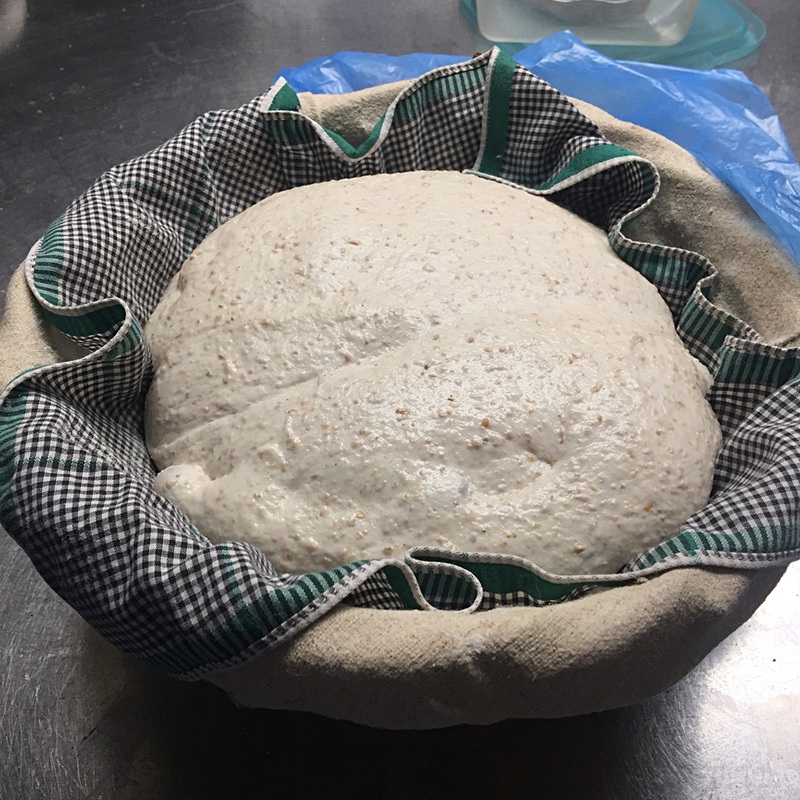 I tend to go by counts to 100, with a little rest after each burst to see how things are going, and it is wonderful to watch and feel as the dough becomes alive and elastic beneath your hands. A wet dough, as it becomes stronger and more structured through a set of stretch-and-folds, is also a delight, but it doesn’t offer quite the same satisfaction as a proper knead. With a lovely, lively ball of dough in your hands, dribble a short thread of olive oil into a bowl and wipe it about with the dough to just lightly coat the surface of the dough. Cover with a damp tea-towel and leave in a warm place to double, about two hours. As you gently persuade the dough out of the bowl, pause again to marvel how extensible it has become. Resist the temptation to “punch” the dough down; a little gentle kneading is all that is required. 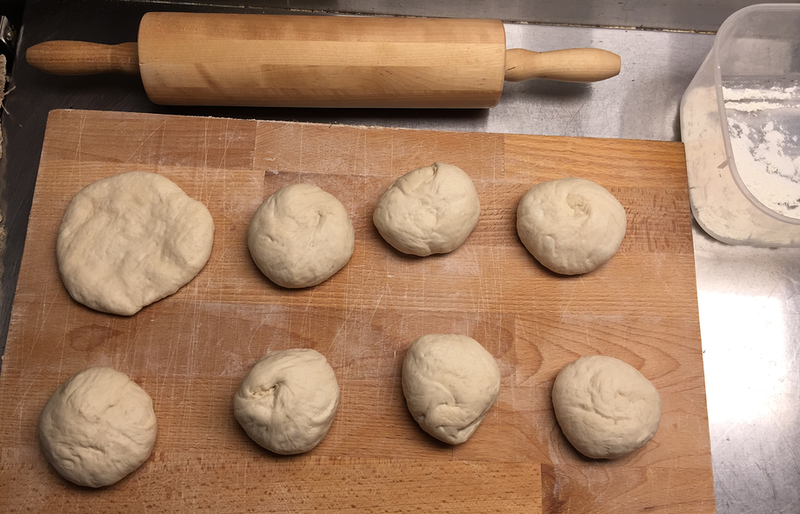 I divided the dough into 8 pieces of 100g (Claudia advises “the size of a large potato or smaller”) and roll each one out on a lightly floured surface to a disk of around 0.5cm thick. Place these on a well-floured couche, cover with plastic film and the damp cloth, and leave again for a second rise of about another two hours. Preheat the oven to maximum (in my case around 240°C) and place a lightly oiled (or non-stick) baking tray in to heat up. Also, prepare to steam. When you’re ready, add the water to your steam container. Then, working quickly, gently lift the rounds from the couche and onto the tray. Gentleness is crucial here; any rough handling and they won’t puff up in the oven. Spray gently with cold water “to prevent them from browning,” slip them into the oven and shut the door. 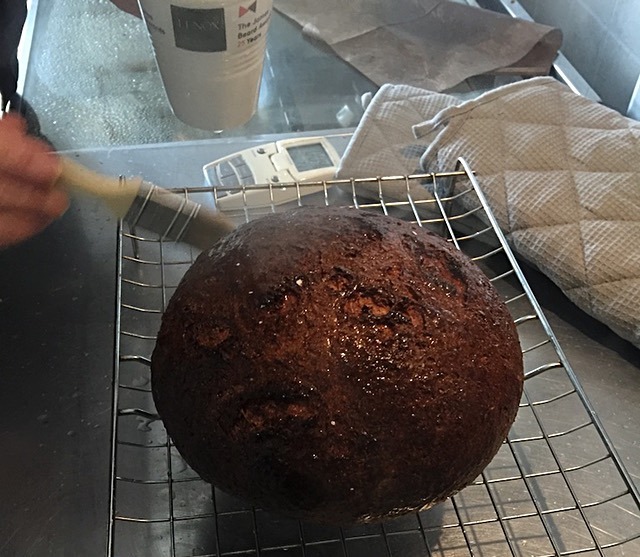 [B]ake for 6 to 10 minutes, by which time the strong yeasty aroma escaping from the oven will be replaced by the rich earthy aroma characteristic of baking bread – a sign that it is nearly done. Do not open the oven door during this time. I gave them eight minutes. Eight long, fraught, anxious minutes. I needn’t have worried. Cool the little flatbreads briefly on a wire rack and if you have any left over, pop them into a plastic bag. Anathema for most breads, but these need to stay nice and soft. I can also attest that they reheat beautifully in a hot cast-iron frying pan. This is an exceedingly versatile bread that will go with pretty much anything savory: my own preference is for what I call “Baltic sushi” – a slab of lightly buttered rye, topped with herring and sliced red onion. 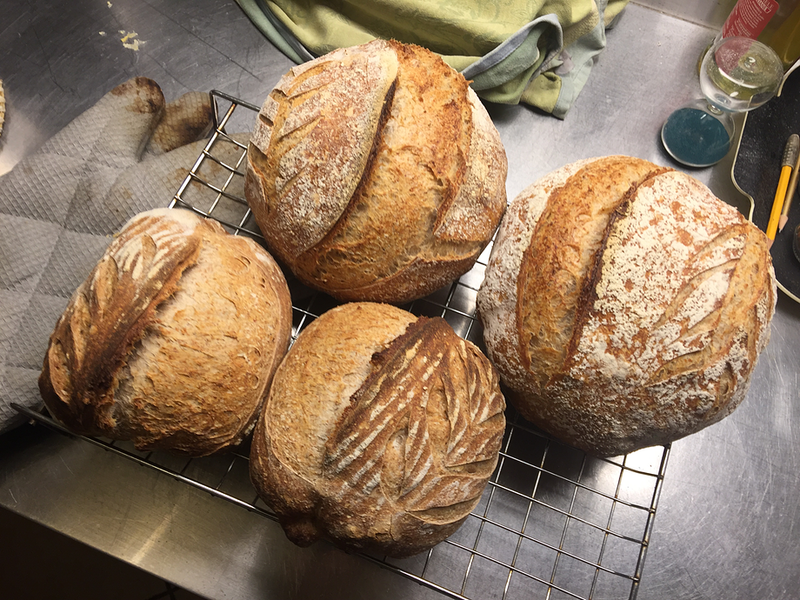 Anyway, I decided to give it a go,2 starting on Wednesday night, feeding my 100% hydration wheat leaven with rye to create the rye sour that the recipe needs to begin.3 The main lesson here was a vivid demonstration of how much livelier a rye leaven is than a wheat leaven. 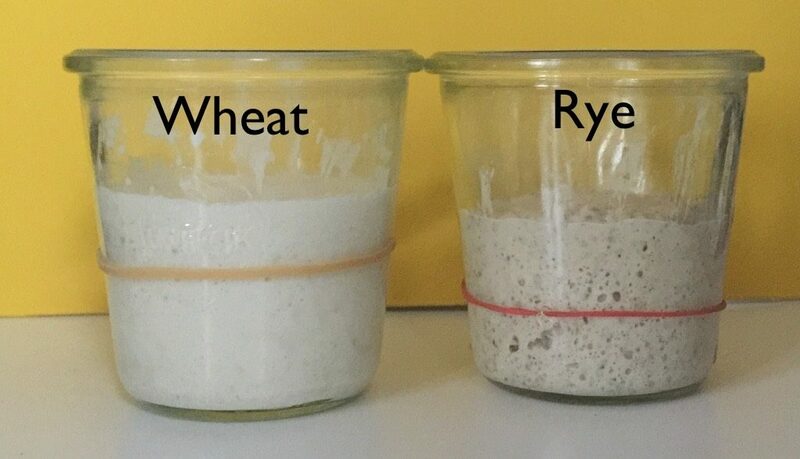 The rye roughly tripled, while the wheat barely doubled. 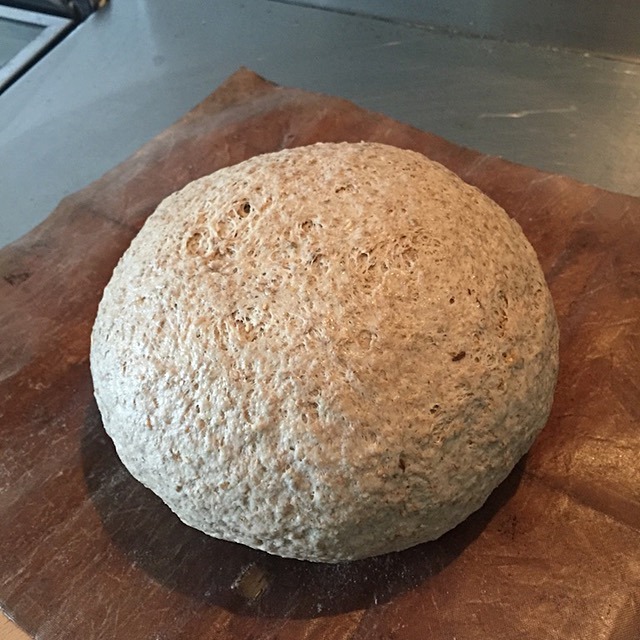 As a result, I was ready to begin the recipe proper, on Thursday morning, with the natural rye sponge. Five grams of starter seems far too little, but it did its job, and of course one of the fine side-effects of too much starter is a pancake for lunch. In the afternoon of the first day, you make the scald. Mixing rye flour with hot, even boiling, water, is a standard technique for releasing some of the sugars. (See Black Pepper Rye.) In Ginsberg’s recipe, the water is at 65°C rather than boiling, and one is supposed to keep the scald at that temperature for three hours. I quickly discovered that even on the lowest setting, my oven was hotter than that, but making use of the thermal capacity of the baking stone and checking every half hour or so I was able to be a human thermostat and keep things at around that level. 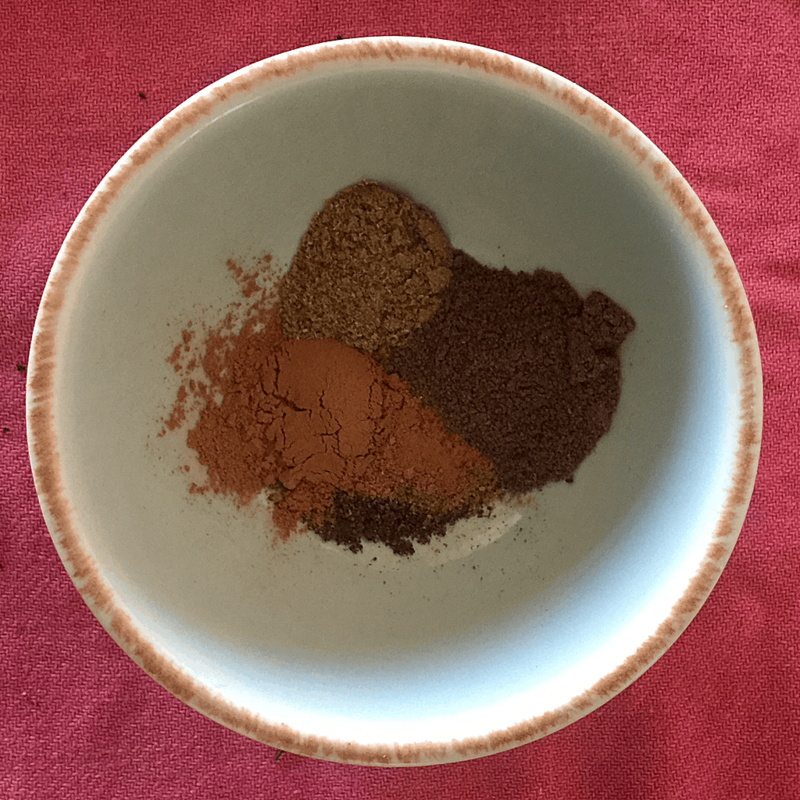 One more misgiving; only 2 gm of caraway seeds? As forecast, the scald became quite liquid during that time, and developed a delicious, somewhat sweet, somewhat earthy aroma. After cooling the scald for an hour, I dumped the now well-risen sour onto it and mixed with my strongest spoon. Ginsberg says this is called an opara. Next morning, having been covered and left overnight, it had bulked up quite a bit and now smelled beery (malty?) rather than earthy. 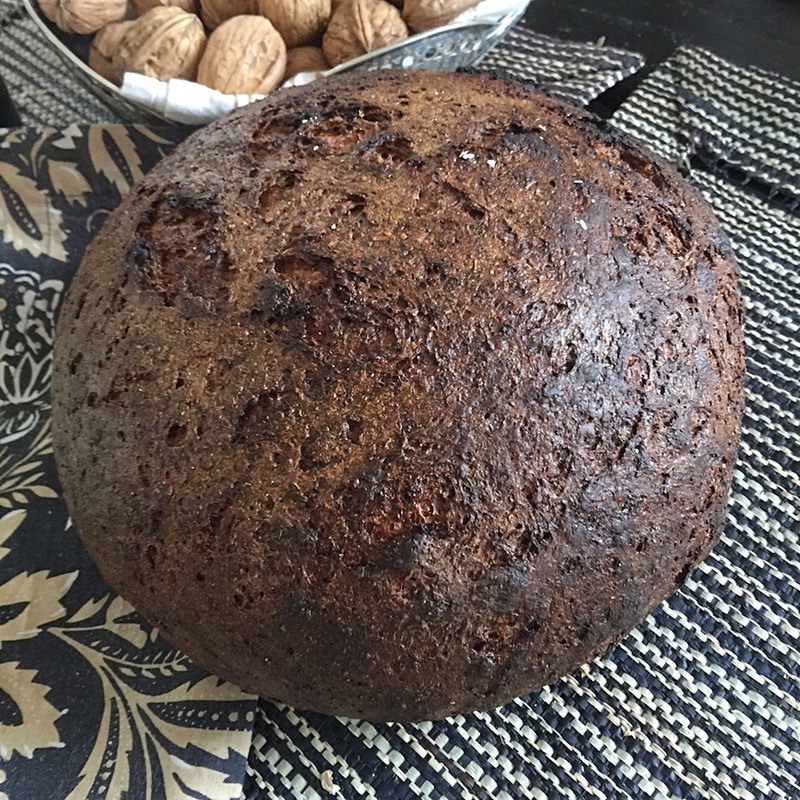 Early on Friday, while the morning cuppa was brewing, I threw together the final component, a yeasted rye sponge, so that it would be ready at about the same time as the opara. Came the moment to mix the final dough, which now gained 100 gm of bread flour, a fraction over 10% of the total flour. It all came together beautifully and despite being tacky in the way that rye doughs always are was not difficult to knead. In the end I stirred for about three minutes to get the wheat flour in, another three to get the rye in and a final three minutes kneading the whole. In a clean bowl, it had risen to double within an hour. I pre-heated the oven and shaped a boule, leaving it to rise again on the peel. After a bit more than an hour, I judged it had expanded enough to go into the oven, and discovered that my water sprayer was clogged. Rome water is so hard. I quickly flicked water over the suface as best as I could and slid the loaf onto the stone. When I opened the oven door half an hour later the most wonderful deep rye aroma filled the kitchen, all sense of beeriness gone, just that nutty, slightly bitter, very grainy smell. Half an hour after that, I pulled out the loaf and brushed the surface with boiling water. 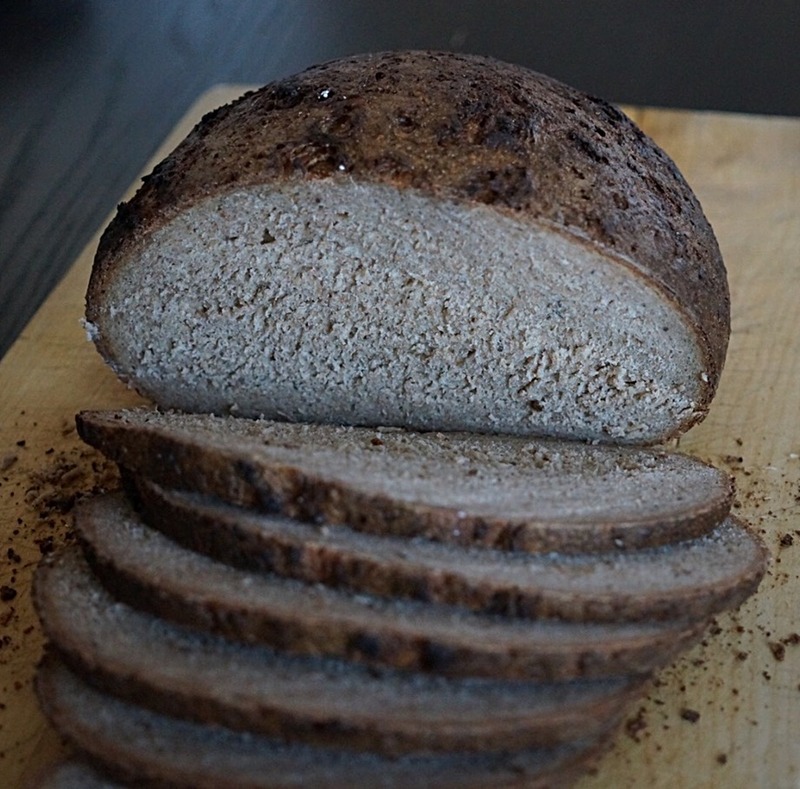 This is new to me, though like the scald common with proper rye loaves, and it was fun to see clouds of steam arising from the loaf, which turned a darker, shinier brown. Not quite a horse chestnut, but getting there. Palanga rye bread, the morning after baking. Fine-looking slices, ready for their filling. Next morning we had a trip planned to the thermal baths, and a sandwich lunch was definitely in order. The loaf sliced quite easily and the crumb was even, soft and moist. All we did for the sandwiches was pile on some mortadella, and the general consensus was that this was most definitely a bread to reckon with. It is chewy, but not tough, and even the tiny amount of caraway comes through, suffusing the taste. The sweetness makes itself apparent later and is a good contrast as it mingles with the earlier flavours of the rye. A definite keeper, this. I thank the steam from the baths for the dreamy look, which perfectly suited the occasion.